ST. GEORGE — Utah has a state fossil, a state insect, a state flower and a state song, but no state reptile – at least not yet. 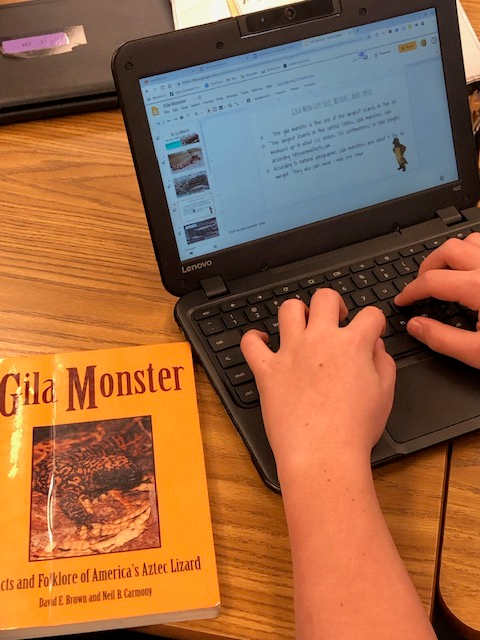 Approximately 70 seventh-grade students at Lava Ridge Intermediate School in Santa Clara are collectively seeking to rectify the situation by asking state lawmakers to designate the Gila monster as Utah’s official state reptile. The Gila monster, or Heloderma suspectum, is a large, venomous lizard that lives in desert areas of the southwestern United States and northern Mexico. Gila monsters are characterized by their stocky build, thick tails and large heads. Their scales are typically black, orange, pink or yellow and resemble a beadwork design. 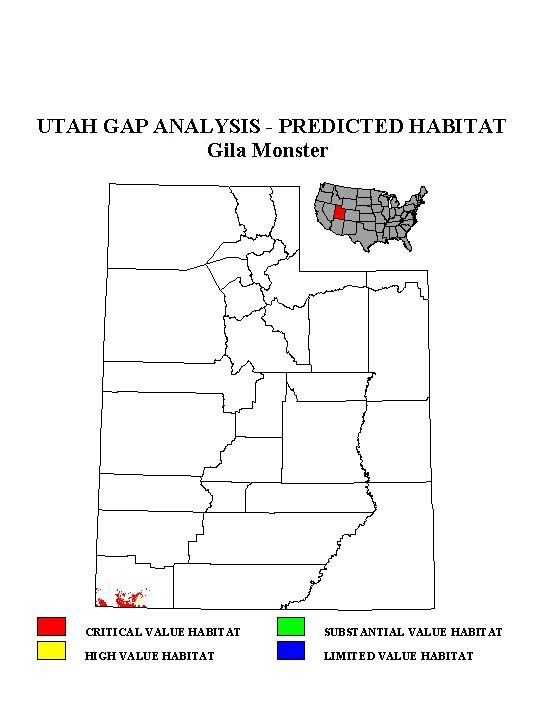 The Gila monster’s Utah habitat is limited to the southern portion of Washington County, as seen in the map at left. Rep. V. Lowry Snow of Utah House District 74 said he was first approached regarding the idea of a Utah state reptile by constituent Anne Evans, a retired scientist. She and her husband recently moved from California to Ivins. “Ms. Evans has an advanced science degree and had studied the Gila monster extensively, even before moving to this area,” Snow told St. George News. “After locating here, she continued in her study of the Gila monster and at the same time noticed that Utah did not have a state reptile,” he said, adding that at least 28 states already have made such a designation. Snow said Evans contacted him regarding the possibility of sponsoring a bill to name the Gila monster as Utah’s state reptile. “I told her I had an interest in sponsoring a bill, but only if it could be done in a way that would also provide an educational opportunity for students living in and attending school in my district,” Snow said, adding that Lava Ridge Intermediate School in Santa Clara was suggested as a good place to start. “After discussing the idea with Ms. Evans and with teachers and school administrators at Lava Ridge Intermediate, it was decided the students could use this project as a way to learn firsthand about Utah’s legislative process while also engaging in science research in order to prepare them to advocate for a state reptile,” Snow added. 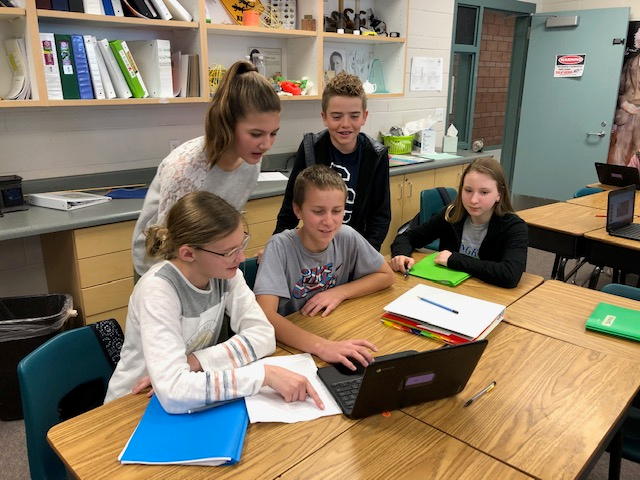 In October, Lava Ridge students in seventh-grade honors science and honors language arts classes kicked off the project by writing exploratory paragraphs on the topic. 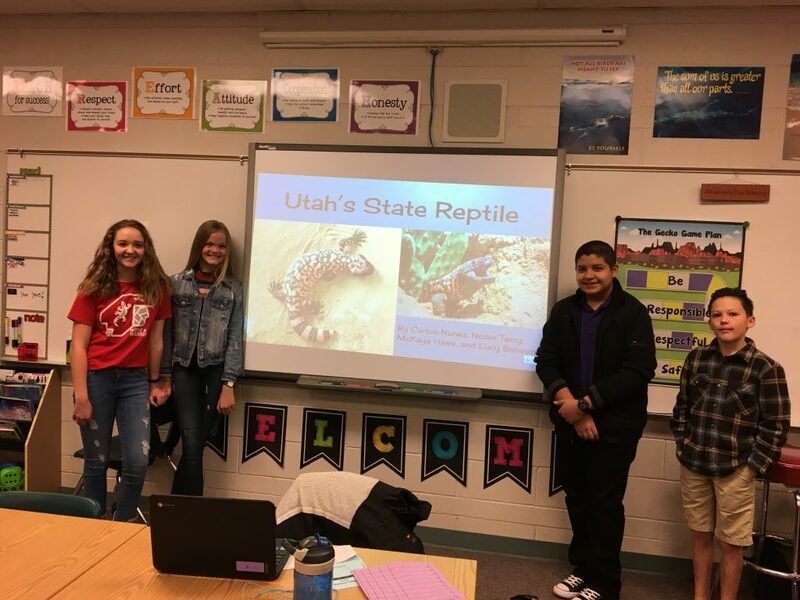 “Students then engaged in a debate, using scientific argumentation, to determine which reptile would have the best chance of becoming Utah’s official state reptile,” Lava Ridge science teacher Alison Lund told St. George News. A student vote was held, and Gila monster was the overwhelming winner, Lund said, noting that numerous other choices on the ballot included the chuckwalla, desert tortoise, zebra-tailed lizard, western banded gecko, desert collared lizard, Great Basin rattlesnake, Mojave Desert sidewinder and regal ringneck snake. “The Gila monster was a clear favorite as it is the biggest and only venomous lizard in the U.S., and though they are not on the endangered list yet, there are laws prohibiting the capturing or killing of these animals, as they are rare,” Lund added. To see a real live Gila monster, the students made a field trip to the Red Cliffs Desert Reserve visitor center in St. George, where they were able to meet a popular lizard known as Hercules. There, the students asked biologist Cameron Rognan what makes Hercules and other Gila monsters so unique. They like to burrow and hide under rocks. They only spend about 5 percent of their time above the ground’s surface. They store fat in their tails, enabling them to go long periods of time without eating. They can eat half their body weight in one meal. Their diet typically consists of eggs, small mammals, birds, lizards, amphibians and insects. One component of their venom has already been approved by the FDA for use as a drug used in the treatment of Type-2 diabetes. The component, a peptide called Exendin-4, is now artificially synthesized in labs rather than harvested from Gila monsters. As the project continued, the students were divided into 17 groups of four students each, and each group was tasked with creating a presentation designed to educate and persuade viewers. Click here to see an electronic copy of one of the presentations, which was created by Lava Ridge seventh-graders Joseph Tsai, Ava Atkin, Kyla Larsen and Kamen Seal. Lund said within the next week or two, the student presentations will be judged by a group of evaluators from the Dixie State University Education Department, after which three teams (12 students in total) will be chosen to travel to the Utah State Capitol in Salt Lake City to formally present their case to the state Legislature, should the proposal, formally known as HB 144, make it to that stage. Rep. Lowry is the bill’s originating sponsor, while Sen. Don Ipson is joining in as floor sponsor. In the meantime, the Lava Ridge students have been asking their fellow students, families, and community members to contact their state representatives and voice their support of the bill. “It has been an incredible collaborative, real-world educational experience. We are so proud of our students and the passion they are showing to make this idea a reality,” added Lund, who is being joined in the effort by fellow seventh-grade educators Rachel Robins and Jenifer Andrus, who teach language arts and Utah studies, respectively. There are currently 30 official state symbols listed in the state code. If the Gila Monster becomes the state reptile, that would make 31. 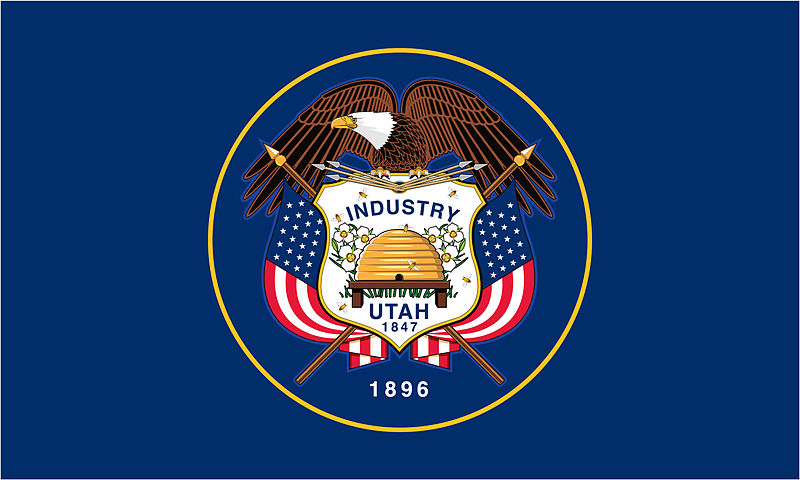 Utah was the first state to have an official state firearm. In 2011, Utah officially made the Browning model M1911 automatic pistol as the state firearm. Seven other states have since designated their own state firearms. Utah’s state tree is the quaking aspen, which supplanted the Colorado blue spruce for the honor in 2014, thanks to the efforts of a group of fourth-grade students in Sevier County. The youngsters argued that the aspen makes up about 10 percent of the state’s forest cover and can be found in all 29 counties, whereas the blue spruce, which had been the state tree since 1933, has a much more limited range. Additionally, one particular 100-acre stand of quaking aspens located in Fishlake National Forest, dubbed Pando, is believed to be one of the oldest and largest living organisms on Earth. Utah has both an official “state historic vegetable,” which is the sugar beet and a state vegetable, which is the California sweet onion. It also has a state fruit, which is the cherry. Utah’s state animal has been the Rocky Mountain elk since 1971. The state fish is the Bonneville cutthroat trout. Utah now has both a state dinosaur and a state fossil. The allosaurus has been the state fossil since 1988, but the Utahraptor officially became the state dinosaur in 2018 thanks to the lobbying efforts of a then-10-year-old dinosaur fan from Provo named Kenyon Roberts. The state gem is topaz and the state mineral is copper, but Utah’s state rock is coal. Utah designated the California gull as the official state bird in 1955. The gull was widely regarded to have helped save early Mormon pioneers in 1848 by eating the hordes of crickets that were destroying all the crops. Utah’s official state sports are skiing and snowboarding, as designated in the 2012 legislative session. Utah’s official state cooking pot is the Dutch oven, first designated in 1997. At least two other states have similarly honored the Dutch oven, namely Texas and Arkansas. Native American rock art and petroglyphs are Utah’s official state art. The official state dance is the square dance, and the official state song is “Utah, This is the Place,” written by Sam and Gary Francis in 1996 to commemorate Utah’s 100th anniversary of statehood. Read full text of bill: Utah 2019 House Bill 144 – State Reptile. Bill sponsor: Rep. V. Lowry Snow.